We are so happy that our products are being well received by the growing community across the States. More and more growers are realizing that upgrading their trimming tools is an important step to making their jobs easier. For years growers have spent all of their energy on streamlining their growing experience, and now the final step is easy….purchasing some PRO 420 blades to get the harvest clipped, trimmed and ready for sale. Dugouts are an easy, convenient and economical way to consume your favorite fine herbs. They are an all in one device made out of the finest woods, crafted to conceal your stash and a one hitter pipe. Open the swivel or slider lid and you have two compartments, one that can hold a few grams of herb and another with a spring loaded slot to pop your one hitter out. Dugouts have been a staple smoking device for decades. Glass breaks, bongs are too big to transport, vapes blow up or constantly need charging, but dugouts last a lifetime with very little maintenance. And if you want to talk economics, many folks do not want to consume large amounts of herb at one time. A lot of people are using it medicinally and this means taking small doses. The dugout is perfect for consuming smaller quantities and still getting a dose that packs a punch. Dugouts are made out of many types of exotic and domestic woods. They are cut from beautiful grained sections of the wood and shaped into small boxes with fine polishes. Accompanying the dugout is a one hitter pipe. The one hitter pipes can be made from different materials including metal, aluminum, ceramic or brass. One-hitters can also have grinder tips that make it easy to break up condensed smoking herbs. A great place to purchase a dugout is from the smokeshop at www.pro420.com. PRO 420 carries a large selection of fine wood dugouts from two of the top makers in the country. They also have a wide range of one hitters to choose from. Any experienced trimmer will tell you that the biggest battle of their job is sticky scissors. Within a few clips most scissors will gum up and become difficult to keep moving at a fast pace. Trimmers will have numerous pairs sitting in a jar of alcohol or vegetable oil soaking the resin off. They trade out every few minutes and wipe away the cleaning solution before resuming. It actually takes a lot of time and effort to keep scissors clean and ready for the job at hand. There really is no way around it, avoiding resin on the blades. At PRO 420, our aim is to find a solution to this major issue. We wanted to offer the trimming community with scissors that are easy to handle and have comfortable grips. We also wanted to see if a teflon coating on the blades would change the game. While the resin will still build up on the blades, it might not get as ingrained on the blades with a teflon coating. With over two years of supplying the growing community with our PRO 420 scissors, the feedback has been overwhelming. Our faithful customers have reported back in detail. The combination of the teflon coating and the new PRO 420 scissor cleaning solution, their jobs are much easier. The jar consists of natural food grade hemp oil and a tight fitting slotted sponge. With an easy screw on lid, this jar can last for up to 400 sessions. have chopped every last bud off their outdoor plants by now and have clipped and cured and packed away their prized possessions. We here at PRO 420 want to hear how it went? Was it a bumper crop? Were there any weather related issues that got in the way of your harvest? And once inside how did the trimming go? Did you use a trim bot or a team of clippers and their shears, or simply your own hands? After our first harvest season doing business as PRO 420, we are curious to see how our scissors held up to your expectations. We are always trying to improve our quality and deliver the finest most durable trimming scissors on the market today. Many customers have asked how to maintain the teflon coating on our Classic and Spring Loaded models. affected by this method of cleaning. that cleans scissors quickly and efficiently in seconds. Its good for 420 uses and has a tight fitting lid so it can store away easily. We hope that our products have helped you trim faster and easier and that you tell your friends about us for next year’s harvest! This is the second blog post in the series written by OT, or Orwell Tesla Jefferson. Revolutionary things are happening in the American culture today. The mainstream opinion on Cannabis has shifted drastically. The American public wants legalization, not incarceration. Mass media is spending more time airing a different and positive view of the herb. Public schools are including medical benefits of Cannabis in health class. It is as if the elite central planners have succumbed to the trend and embraced its inevitability. I personally have never met an individual that believes another human being should be locked away for possession and use of marijuana. Even the folks that say, “we should definitely not legalize it” will still concede that jail time is very extreme for pot use. I believe the internet has helped diversify our sources of news and information. People are learning, through various information outlets, the truth behind the myth. Cannabis is not the highly dangerous drug we were taught about in school. Despite what television news and the DEA tell us, there is a known medical benefit. They intentionally lied to us. This could easily segway to thousands of other things that they have lied to us about. Consider for a moment that your reality is a construct of these lies engineered by an elite, powerful group. We are highly manipulated! So back to reality, marijuana is a wonder-herb that cures cancer, treats depression and impotence, provides a general feeling of well-being and promotes peace. It is also a hearty, easy-to-grow plant readily harvested by the poor man! Naturally, we should prohibit this plant. We should use the power of police and a prison system to enforce the prohibition, the power of the school system and media to brainwash the people and instead fill the gap with substances we can patent, control and sell, like pharmaceutical drugs and alcohol. Fast forward a few decades of information sharing on the internet and the people catch on to the trick. Pioneer states throw their middle finger to the federal government in blatant disregard for their draconian Cannabis laws. States wage war with the Drug Enforcement Agency over a plant that should be a natural, inherent right in the first place. Who are we to be so vain as to attempt to legislate a natural, peaceful, healing herb out of existence. Believe it or not, the same bone head thugs that champion the prohibition are often users themselves. I am so happy that finally the ignorant, corrupt laws of the past are changing. I have family traditionally opposed to Cannabis that are slowly changing their perspective. When folks learn the truth it becomes so obvious. It is a flower created naturally like the organic earth around us, and it is capable of healing the world. This is why I am Pro 420. 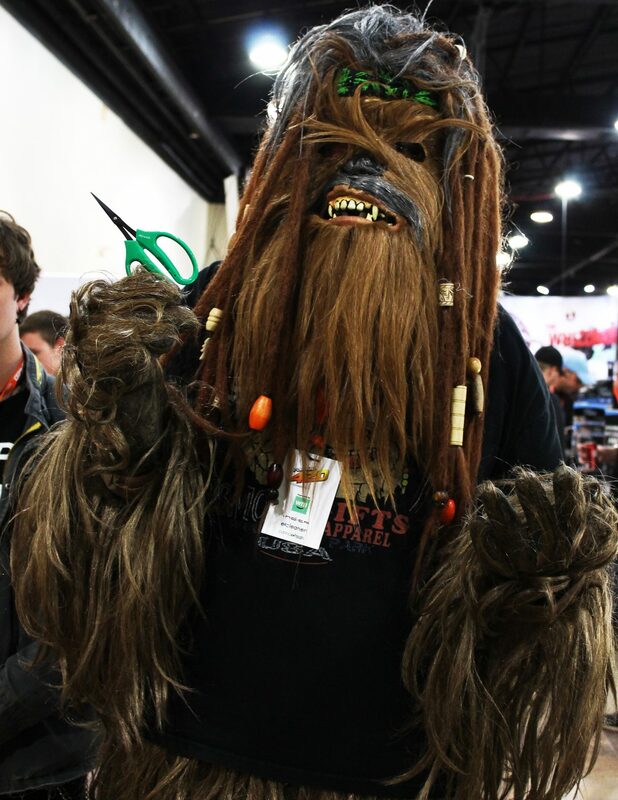 A day in the life of a Marijuana trimmer…. 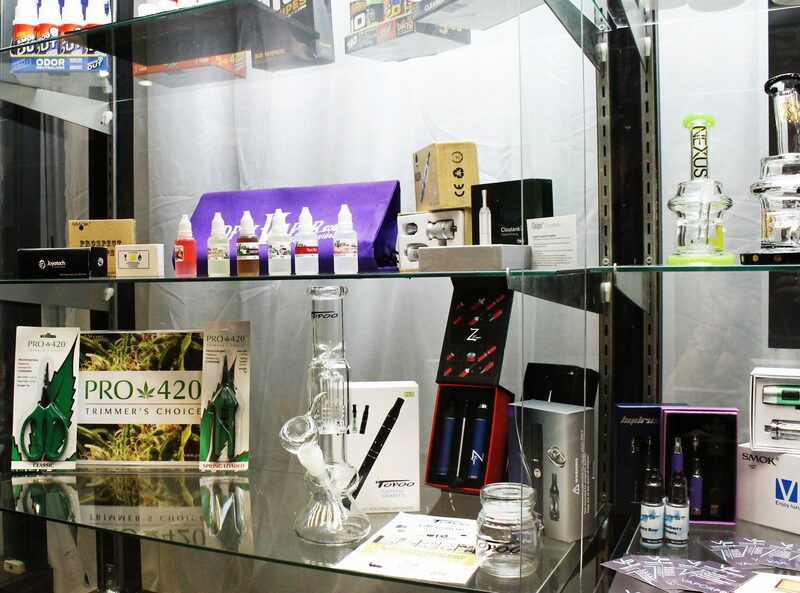 Walking into a dispensary is a moment of pure joy for many patients. The sight of labeled mason jars filled with a variety of medical marijuana is relief for many, and a work of art for others. America in 2014 has radically shifted its’ policy on this miracle plant and slowly but surely States are embracing Marijuana as a cure all for hundreds of ailments and diseases. The road from budding plants to jars filled with flowers has to pass through the trimmer. Once the buds have been clipped from the plant, they are hung and dried. After the drying is complete, trimmers take each bud and carefully remove all the shade and sweet leaves from the buds, as well as sticks and stems. The finished product is much more aesthetically pleasing and showcases the amount of crystal present on each bud. Trimmers that work in dispensaries have to be fast with their hands, be motivated to finish piles of work, and be calm enough to sit for hours on end doing repetitive clipping work. Trim scenes can be as simple as a closet grower trimming an ounce of weed at his/her kitchen table, or a line of trimmers clipping through pounds a day in a factory setting. How do you trim? What is your favorite music to listen to when you trim? What kind of scissors do you use? For professional trimmers, setting up their station is very important. Placement of your tray, the scissor cleaning jar, the lights, and the type of chair are all very important to the work atmosphere and how fast you can trim. Every day is different, as various strains produce buds of varying size, density and quality. A day spent trimming large buds may produce over 2 pounds of finished product, while a day trimming ‘B’ buds may produce less than a pound. One key factor is the scissors, for sure. 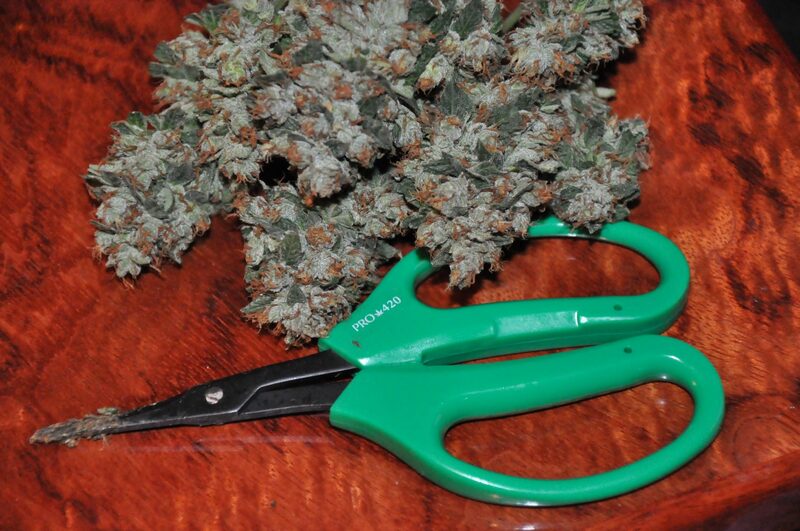 If you are working each day as a professional trimmer you will want to make sure you invest in a quality pair of marijuana scissors that do not stick, that are comfortable in your hand, and that have a fast clipping action. Trimmers are the unsung heroes of the medical marijuana industry, helping transform a scraggly bud into a work of art. By removing the sweet leaves from buds, the potency per gram increases significantly helping the consumer get the most bang for their buck. So, what does a day spent trimming look like for you? I just couldn’t sleep the night before the flight. Every 10 minutes I would think of one last thing I forgot to pack for the trade show. The moon was heading into a full eclipse, the energy was intense, and by 5am, I had probably slept no more than 2 hours. But it was time to go, and after a strong espresso my dedicated behind the scenes manager, otherwise known as ‘bro’, came and picked me up and brought me to the airport. On the plane from Atlanta to Denver, I sat next to a buyer from Greensboro, NC, headed to the show to stock his head shop back home. We talked about the show, the legality and covered every aspect of the industry in three straight hours. In Denver I jumped in a shuttle headed downtown, and within 10 seconds noticed that Marijuana was permeating from every outlet. The conversation a row back was between two gentleman. One very friendly and outspoken man who had been in the industry in one way or another for 30 years, while the other was coming out with a new LED lighting system. The middle aged lady beside them was a buyer from Wisconsin. The billboards advertised legal weed and 420 events, while the talk radio blared a conversation about, you guessed it, weed! Before I got out of the shuttle, one of the passengers reminded me to visit weedmaps.com to find a local dispensary. Arrived at my guest house on East 19th Ave and was greeted by a nice older lady and her 6 chickens, who seemed to have taken shelter in the living room. My room was next door, so the first night I didn’t really get much sleep with all of the pecking going on. The second night I came home from the show and my nice host was sitting on the couch with them pooping on her and the furniture. I was safely closed into my bedroom while her very dynamic conversation with her chicks continued, for about an hour. On the third day, as I was leaving in the morning, I noticed that the gardener had shown up to build them a decent home outside in the tiny backyard. As the chickens moved out, the busy host welcomed a handful of 20 year olds who forgot to wash up, much to the dismay of our host. And so goes the stories inside an Air b n b. I made strong coffees each morning and spent all day at the show. The Big Industry Show was a hoot. I would say 60% of the booths were dedicated to glassware, from mini one hitters to large bongs. Vape companies dominated the big spaces, while one giant only sold soil. The big fish lined up across from the little fish, but it worked. Pro 420 had the best neighbors, Pimp n’ Ballz, Pine Street Woods, and Cowboy Glass, and behind them, a whole corner dedicated to southern California’s finest street and gallery artists. 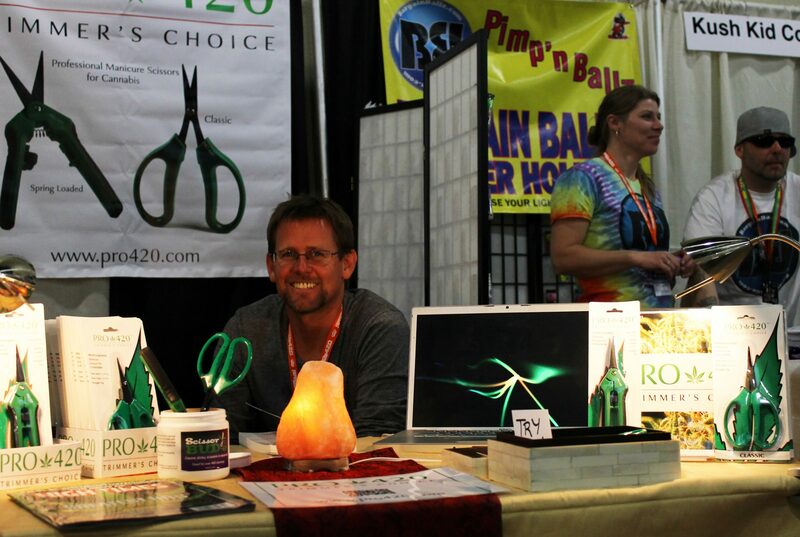 We were definitely an attraction to buyers as we were the only scissor company at the show. There were about four other booths dedicated to trimming, but all offered machines and electric hand held devices to chop your buds up. Everyone agrees that in reality growers will need both methods to grow, harvest and manicure their marijuana. I really enjoyed the dialogue with the customers and general public and learned a lot about their needs and opinions. Overall, I almost sold out of scissors, had a ton of promising connections with growers and trim scene managers, and passed out a ton of stickers and business cards to potential customers. A few big fish visited, and a ton of friendly smaller ones too. The lovely Alex Robinson came and worked the booth with me. A native Chicagoan now residing in Denver, she was able to photograph all of the beautiful images and funky scenes from the Big Show, as well as help me sell the scissors. She did a fantastic job and charmed everyone who showed up to check out our products. All the images you see of the show are shot by Alex. I’m not 20 anymore, and after each day I found my way back to the chicken coop, tired and ready to get horizontal. By Saturday, the show was long gone, as the Cannabis Cup moved into the spaces around the Pavilion and in to the surrounding conference halls. I took a quiet shuttle to the airport, and the last scene out of Denver for me was a large warehouse on the side of the highway with a banner reading ‘ Recreational Marijuana Now For Sale’ with a line of customers outside, waiting for it to open. It was 9am in the morning! At the airport I made my way to check-in, and out of the corner of my eye saw Arjan, the founder of the Green House Seed Company and main man of Strain Hunters, a fun weed adventure show on youtube. I quickly ran up to them and did one last pitch, gave them a card, showed them the scissors, and talked about Morocco and India, places they had visited in their show. 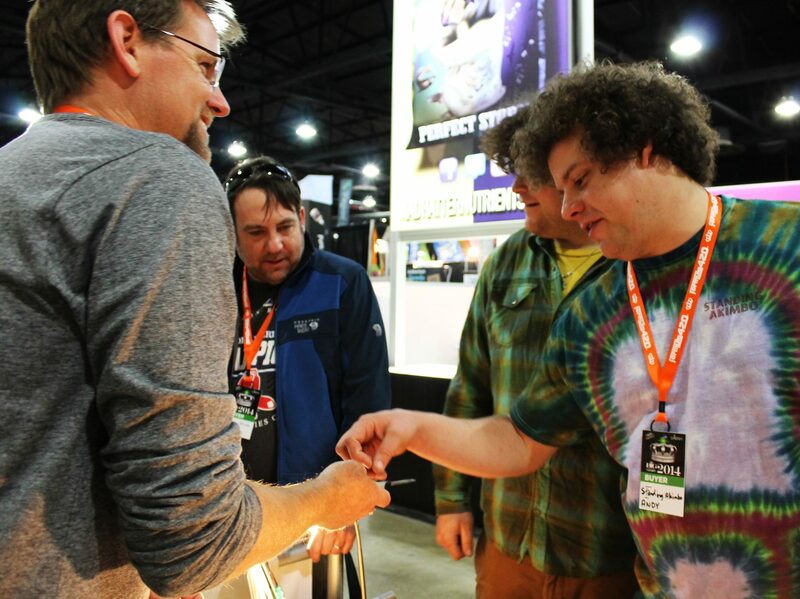 That was a great buzz to see and meet those guys and a great way to end a perfect week of introducing my scissors to the Marijuana Industry and its players. Uncle Sam, the time is now! PRO 420 is much more than a scissor company. With that kind of name we better know which position we stand for and provide our customers and followers with pertinent information, opinions and historical facts to support this growing movement.As we are busy selling our scissors, we would like to introduce to you our newest blogging member, Orwell Tesla Jefferson, or as we like to call him here in the HQ, O.T. Federal law prohibits us from placing a seed in the earth. We are unable to nurture, grow, harvest and consume a flower that grows naturally. Our uncivilized legal stance on Cannabis has stood for too long. For thousands of years mankind has fostered this plant alongside us, preserving genetics to treat an array of physical and mental health issues naturally, from a planted seed. This plant reduces pain, excites the imagination, induces happy feelings, raises spiritual awareness, stimulates sexuality and perpetuates peace and love, not to mention the numerous textile benefits of its close cousin, hemp. Our ancient ancestors viewed Cannabis as a gift from God. The morality and legality of marijuana was a no brainer. Fast forward several thousand years of documented use to Colonial America. The Declaration of Independence was written on hemp paper and cannabis oil was used commonly for medicine. The first American law regarding marijuana was issued ordering the people to grow hemp. At this time, common sense continued to prevail over powerful special interest groups. Fast forward a few hundred more years to the 1930’s when lobbyists for powerful corporations finally succeeded in persuading the U.S. government to outlaw the cultivation and use of Cannabis. Cannabis is a natural robust weed, capable of being grown in every corner of this planet. Cannabis is viewed as an obstacle to a massive windfall of profit and control. An elite group centrally engineers our culture and meters our every move. This group is experienced, resourceful and highly intelligent. They coalesce into different forms, such as Big Pharma and the FDA. Because Cannabis cannot be patented, pharmaceuticals would lose trillions of dollars in sales over decades to a natural plant that anyone could grow in their backyard. While these elite groups benefit financially, we continue to be victimized by a senseless and unjust legal system. The repercussions of this hoax are huge. While some people will comply with an unreasonable law simply because it is law, many people will not. The most successful system for prohibiting Cannabis has been to deny employment for using the plant. People who could be benefiting from the medicinal qualities of this plant are denied access because of legal implications. Instead, the system replaces this beautiful natural creation with dangerous prescription drugs as your only alternative. It is an elaborate hoax engineered to the detriment of the common people. Blue collar, hardworking folks suddenly cannot use medical Cannabis for fear of being fired. Instead, they are turned on to the fatally dangerous, addictive alternative of synthetic pharmaceuticals. Our coworkers, friends and family coping with grief, stress or pain therefore have limited choices, and none of them are very appealing. Abstinence from marijuana is a prerequisite for employment almost everywhere. If you want a job, you cannot smoke pot. Touch pot while you are employed and you will be paranoid for thirty days, hoping to avoid an injury or random urinalysis. Get caught smoking pot while employed and you will be terminated. Regardless of your work ethic and your will to work, the system will have you fired for using a plant that cures cancer. Our law says Cannabis is as equally dangerous as LSD, MDMA and Heroin, and Cannabis is more dangerous than cocaine, meth, and oxycontin. It is an ignorant rating system that ranks drugs in that order, and it actually hurts the credibility of those that champion the law. The physicians know it, the States know it, the legislators know it, and the people are learning it! In recorded history, Cannabis has never caused death or overdose. People are learning about decades of propaganda and standing up against the tyranny. Ultimately the movement to reform Cannabis laws is winning. Folks that continue to support the uncivilized philosophies of the past will be left behind. Invest in Cannabis now, the time is right. The movement is happening now. It will win, and soon. If you are Pro420 please show your support and spread the word! Are you a Bud Connoisseur? Are you a bud connoisseur? Many people who smoke, vaporize or cook with medical marijuana prepare the flowers before use. This entails either crushing the buds in a grinder, mashing them with your fingers, or cutting them up with scissors. Let’s look at the benefits and drawbacks of these three methods. + The grinder is a handy invention for anyone needing to obliterate their herbs into fine powder. A grinder requires little effort and can do a fairly good job of breaking apart the bud. Some grinders come with a stash compartment built in. – Grinders are hard to clean. While grinding, a lot of the most potent pollen from the plant ends up stuck in the teeth of the grinder. This can be difficult to remove, and is not something you would want to wash away. Grinders can be wasteful for those that like to conserve. + If the bud is dry enough, rubbing it between two fingers should do the trick. More humid bud that has not been cured properly or missed an extra day hanging will not break up easily with your fingers. – The only downfall of using your fingers is you will inevitably end up with pollen on your fingers, so if you need to be discrete it’s best to not physically touch the bud. + The real connoisseur, according to insider sources, use scissors to finely chop their buds into pieces. With scissors, you get to thoroughly clean the bud, ridding it of sticks and stems, excess leaves and any other debris you may find. The scissors that work best have needle point blades and equal size finger holes. 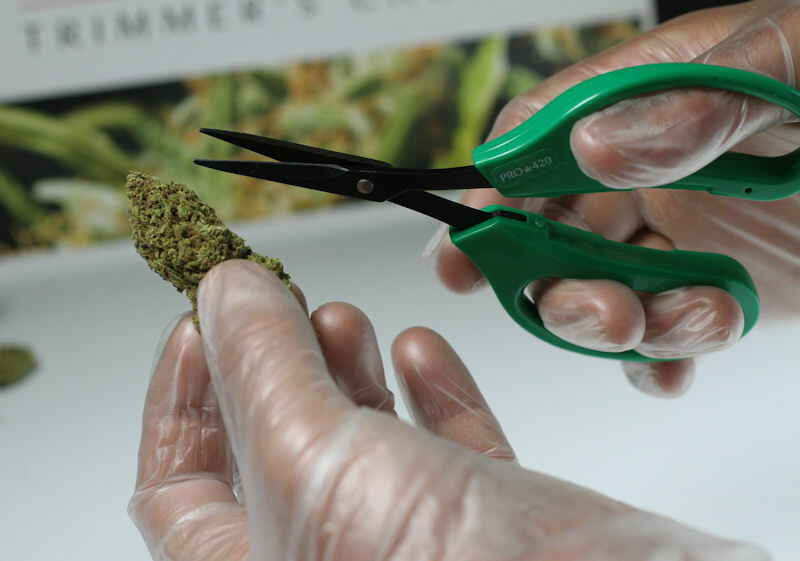 The main reason connoisseurs like to use scissors is that they do not waste a flake of good bud while chopping. Buds will not be stuck in a grinder, or mashed into your finger, they will be where it counts, in your stash tin! – Not sure if there are any, except that eventually they will need cleaning. Unless you have a jar of oil, alcohol, or this new jar of cleaning solution, cleaning the resin off the scissors can get sticky. You may not believe this, but PRO420 is rooted in a family history of scissors. Growing up talk around the dinner table was based on scissors: the quality of German implements over Italian implements, and the stories from business trips to factories far far away. Although the sale of scissors fed our family, it wasn’t on the top of my list of interesting subjects. Throughout the years my brothers, a sister, father, three uncles, cousins and a Grandfather all took part in one way or another in running the family business. I opted out after a year in the factory and stuck to music and travel. Fast forward many years and here we are, on the brink of a huge Marijuana revolution in this country. PRO420 Manicure Scissors are here to deliver a quality implement for the thousands of trimmer’s that go to work each day to trim Cannabis. My families expertise has helped guide me in bringing these scissors to market. It’s incredible to have a team that has decades of experience already behind them in order to help shape ideas and construct the best business possible.It’s taken my dad out of retirement and back into the production room, tweaking the packaging and inspecting the finer details of every set of blades. With their help I sincerely hope that trimmer’s will have an easier time at work, and can benefit from all of the special features that are designed into our scissors. Happy Clipping!